Welcome your new master: RoBoHon is a little robot that wants to rule your life, because he's basically the yappiest smartphone around, and one with limbs too. We've checked the date, it's not April 1st. RoBoHon is real, a Sharp project that aims to put everything your smartphone does into a 20cm-tall robot. It talks, it moves, it takes pictures, and it's all set to go on sale in Japan in 2016. But we still had to check a few times that we weren't reading a teaser for a new episode of Black Mirror. The teaser video shows normal-looking folk walking around with RoBoHon in their suit pocket, or on the bedside cabinet, bleating out notifications and alarms like a little insistent dictator. He has voice recognition, dual front cameras and 4G/WiFi to give him all the data access our phones are used to. Any evil spirits looking for a creepy toy to inhabit could do a lot worse. Breaking the robot fourth wall a little bit, there's a 2-inch screen on the back you can interact with more like a phone screen. You don't just have to talk to RoBoHon. 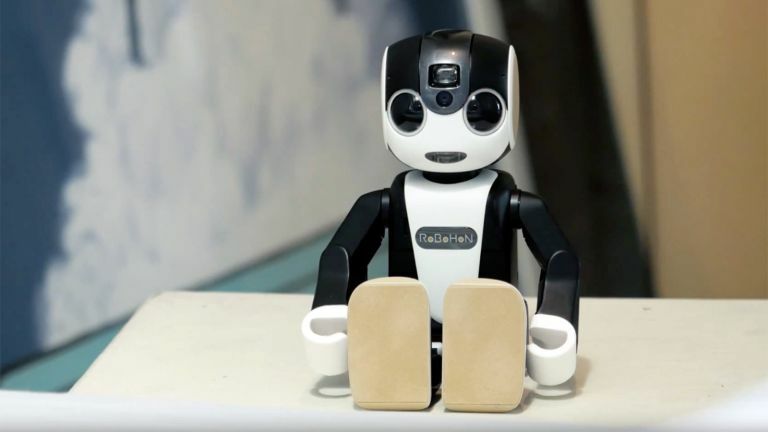 Equal parts cute and creepy, and likely to cost even more than a Samsung Galaxy S6 Edge, we don't think RoBoHon will come to UK high streets and time soon. But our lives won't quite be complete until we get a chance to play with one.